Connect this product to your surveillance network and let it find your IP cameras automatically. 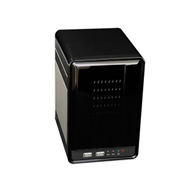 This Linux-based DVR will auto-detect and record real time video from up to 4 megapixel-rated IP cameras. Perfect for surveillance networks.